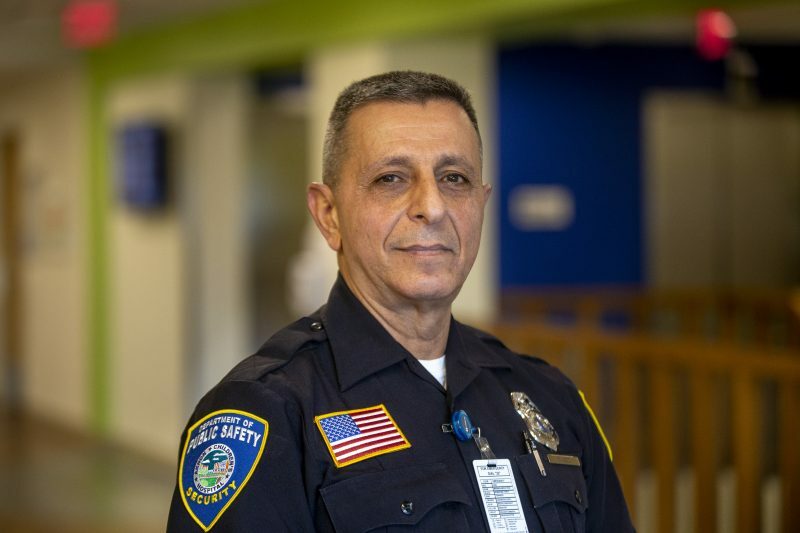 When he retired from full-time law enforcement work in 2012, Gary Abeid wasn’t quite ready to permanently turn in his badge. During his 29-year tenure as a Youngstown-area police officer, Gary also served part-time at St. Elizabeth Boardman Hospital. Comfortable working in a hospital setting, he decided to return to St. Elizabeth’s in 2013 as a part-time public safety officer for Akron Children’s neonatal intensive care unit on that campus. As much as he has loved his career in law enforcement and security, Gary says his dream job would be opening a small Italian market with his wife, Cheryl, who he describes as a fabulous cook. “We would be known for Cheryl’s signature red sauce and homemade meatballs,” Gary said. We asked Gary to share a little bit more about his life on and off the job. When did you start working at the hospital? I started working for Akron Children’s part-time in March 2013 and full time in 2017. Public safety officers in Mahoning Valley are responsible for many tasks throughout a work day – something as simple as being called to unlock a door to assisting staff in defusing a highly volatile situation. My department conducts fire drills and Code Adam (missing/abduction) drills, as well as interior and exterior patrols. We pick up bank deposits from different departments and deliver the deposits to the bank. On occasion, we make badges and/or adjust access levels on current badges. We handle the property control for lost and found objects and arrange transportation when requested to do so for nursing or social work. What’s the #1 rule you live by on the job? My philosophy is ‘to make a difference in someone’s life today’. Key skills you need to do your job well? As it relates to a patient or their family or friends, it would be having the ability to be empathetic. From what I have experienced in this job, I can’t say enough about how important empathy is. It’s key to have the ability to be a figure of authority without presenting a threatening persona. As it relates to other aspects of the job, I would say being analytic. I need to be able to recognize and identify a problem or irregularity and take prompt action to correct the problem. How do you handle fear or an uncertain situation? Handling fear begins with having confidence in yourself, your training, your fellow officers and other co-workers and knowing they will assist and come to your aid without hesitation. If you find yourself getting into something that could result in physical harm to you or anyone else, having the ability to reassess the situation and changing your planned response is vital. What are some simple rules employees can follow to make themselves and their environment safer? Be aware of your surroundings. I observe employees who remain in their cars for extended periods of time either at the beginning or end of their shift. Usually, they are texting, or interacting on social media, without ever looking up – oblivious to any activity around them. I would encourage people to not sit in their car for an extended period of time where you give anyone with less than good intentions the opportunity to confront you. Cheryl and I have been married for 39 years. We live in Campbell, Ohio, which is where we raised our 2 children, Jessie and Anthony. Jessie and her husband live in Cortland, Ohio, with their sons Andrew and Elijah. Anthony and his wife live in South Carolina and are expecting their first child. My wife has worked in retail for 27 years, but now has her dream job of being a full-time nanny for our youngest grandson. Cheryl and I enjoy cross fit training and remodeling our home. And, I enjoy eating Cheryl’s fabulous cooking! You recently received a Character Counts award. Tell us about that? Last year I was called to assist with a combative patient. As it turned out, this patient had been at our campus before, under similar circumstances. The first time he was here he allowed me to speak to him and what he had been going through. We spoke for quite a while and I checked back on him several times throughout my shift and wished him well when my day was done. On my second occasion meeting this same young man I called him by name, asked him what had happened and if he was OK. He remembered me, calmed down and began to tell me what had transpired. I don’t think I did anything different than any of our other officers would have done. I think my prior interaction helped establish trust – he knew I was going to treat him with respect. After that, he cooperated with staff and allowed them to treat him without further intervention.